A well-controlled cooling secures that the conductor temperature at the end seal when the insulated core comes out from the pressurized curing tube is low enough and the generation of voids is prevented. In the Open Water Cooling Circulation OWCS water is pumped from the unpressurized water tank through the heat exchanger to the end of the cooling tube. Thus the cooling operates by a counter-flow method. In the beginning of the cooling tube, water flows back from the water trap to the unpressurized water tank through a control valve, which controls the amount of water in the water trap. This design ensures that there is always water in the touchdown area, and that the cooling section is always filled with water. There is a water detector in the neutral tube, which prevents water from entering into the curing section by stopping the water circulation pumps and alarms the line control. 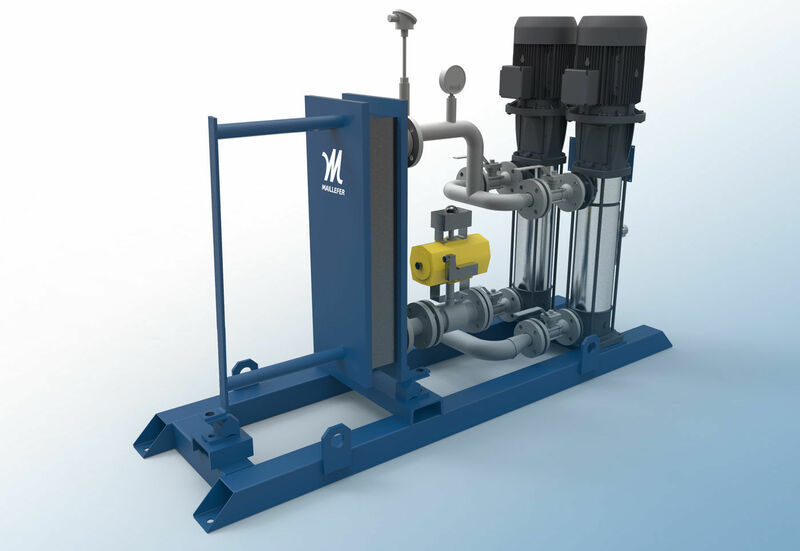 The water circulation unit includes two water circulation pumps, a heat exchanger and the necessary valves. The piping is made of stainless steel and includes water circulation pipes, valves and flexible hoses. The unpressurized water tank is not included in the standard delivery (optional). Maillefer will give a main dimension drawing of the tank to the customer. The tank must be equipped with a cover and a ventilation. The water space is separated with a filter mesh, into a clean and a dirty side. By-products can be easily removed from the open tank. The water circulation unit consists of two pieces of water circulation pumps (one is spare), a plate type heat exchanger, necessary valves and instruments. All these components have been installed on the same frame, which forms one complete unit. The water circulation unit is ready-fitted and completely tested. The water trap for CCV line is equipped with a lid including a sight glass, a by-product outlet and a level sensor with a magnetic display controlling the water level height in the water trap.